Who is Froggy's dad? Froggy knows who his dad is not--he's not the roaring lion or the squawking parrot or the growling bear. And with the turn of each page, Froggy gets one step closer to finding him! This enchanting board book follows Little Wolf as he searches for someone to play with and carries a simple yet profound message about prejudice and preconceived notions. Little Wolf is bored, and so he asks some other animals to play. But no one wants to join him--not the squirrel, nor the bunny, nor the fox. Their parents have told them not to play with wolves. But when Little Wolf meets a bee, she is brave enough to play and the two have a great time. The other animals see there's nothing to be afraid of and decide to join in. With bold colors and appealing characters this book packs a powerful lesson about overcoming prejudices and not judging someone before you know them. TouchWords is a brand new extension to the beloved, groundbreaking TouchThinkLearn series, now with raised letters that fit into die-cut shapes! This is a full handson, sensory experience, associating the tactile shapes of letters with the objects. Rilla Alexander executes a fresh design incorporating the classic elements of the TouchThinkLearn first words format, with core vocabulary and stretch words on each page helping children expand their vision of words and how they work together. TouchWords is a brand new extension to the beloved, ground-breaking TouchThinkLearn series now with raised letters that fit into die-cut shapes! This is a full hands-on, sensory experience, associating the tactile shapes of letters with the objects. 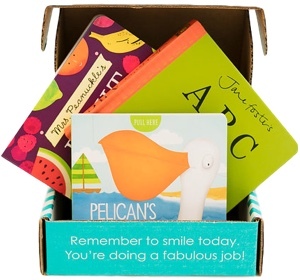 Rilla Alexander executes a fresh design incorporating the classic elements of the TouchThinkLearn first words format, with core vocabulary and stretch words on each page helping children expand their vision of words and how they work together. In this new book illustrated by award-winning artist and designer Sara Gillingham, a boy gathers a bunch of flowers for a beautiful bouquet for his mother in this simple and sweet story that features a counting element: 10 to 1. A lift-the-flap book that lets little ones farm the farm! This interactive novelty board book encourages readers to care for animals at the farm by lifting the sturdy flaps on each spread. Feed the hens, brush the pony’s mane, and open the gate so the cow can graze in the pasture in this inventive and engaging book that teaches little ones how to be responsible. Show Dad how much you care with this delightful board book from the creators of The Perfect Hug and The Biggest Kiss. From his stubbly kisses to his sky high piggyback rides to his bedtime stories, no one is quite like Dad. This charming Classic Board Book is a celebration of dads everywhere! We're keeping tabs on Maisy! Explore the many things in her world -- indoors and out -- with two tabbed board books that babies and toddlers will love. What kinds of things does Maisy see when she goes outside? Turn to the tab with a soccer ball on it to find the park, with swings and a skateboard. The tab with a chicken on it takes you to Maisy's favorite farm, with a horse, a sheep, and more. There's so much to explore on the beach and in the sea, on sunny days and rainy ones, on trains and in fire engines and all sorts of things that go. Naming everyday things is always more fun with Maisy leading the way! We're keeping tabs on Maisy! Explore the many things in her world -- indoors and out -- with two tabbed board books that babies and toddlers will love. Wondering what toys Maisy likes to play with at home? Just look for the tab that shows a puzzle piece and turn straight to the page. Who are Maisy's favorite pets? Find the tab with a fish on it and discover some animals both expected and surprising. From Maisy's living room (look out for the cactus!) to her bathroom, whether she's eating or making music or dressing up, the names and pictures of things in Maisy's house will be delightfully familiar to little readers. Manners don't come naturally to everyone! But did you know that elephants are known for their impeccable etiquette? It's true! This hilarious guide to good manners offers many fun teaching moments for kids and their parents--it covers all the basics for the preschool set, from saying "please" and "thank you" to sharing and being kind to others. Filled with bright, adorable illustrations in Hello!Lucky's inimitable style, young children will love learning about manners with this delightful, sturdy board book. This fun and colorful board book introduces children to the joy of bike riding and bikes in many forms. There are big bikes, small bikes and extra tall bikes, and old bikes, new bikes and built-for-two bikes, and more! Inspired by the strong biking culture and community in the Pacific Northwest, this board book features different types of bikes and the diverse people, young and old, who enjoy them. It features bikes children will recognize and some they can imagine, like bikes that wear shoes and bikes that fly. Have a suggestion for a book to add to this list? Send an email to [email protected] with your book and list suggestion.